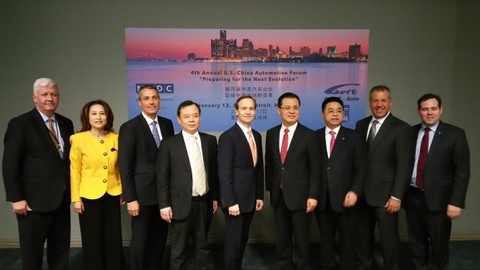 On January 12, Chinese Consul General in Chicago Mr. Zhao Weiping attended the 4th US-China Automotive Forum in <?xml:namespace prefix = "st1" ns = "urn:schemas-microsoft-com:office:smarttags" />Detroit, Michigan. Governor Rick Snyder and Lt. Governor Brian Calley of Michigan, Chairman of China Council for the Promotion of International Trade (CCPIT) Automotive Industry Committee Wang Xia also attended the event, along with about 200 representatives from the two countries' business communities, including top executives from auto producers such as Ford, General Motors, Chrysler, Beijing Automotive Industry Corporation. Consul General Zhao said that in spite of the complicated economic situation in China and the world as a whole, the auto cooperation between China and Michigan continues to maintain good momentum. Michigan-based American auto companies are doing very well in China. Chinese auto companies have always chosen Michigan as their most important investment destination in America. He emphasized that the Chinese government has the full confidence in overcoming all the difficulties and achieving its established goal of China's social and economic development, which will certainly continue to provide important opportunities for business cooperation between China and other countries. He believed that the year 2016 will be an even more active and fruitful year for China-Michigan economic cooperation. Consul General Zhao also expressed high appreciation to Governor Snyder for his great efforts in promoting the friendly relations and cooperation between Michigan and China. In 2013, the CCPIT Automotive Industry Committee launched with other parties in Detroit an auto dialogue between China and the US. 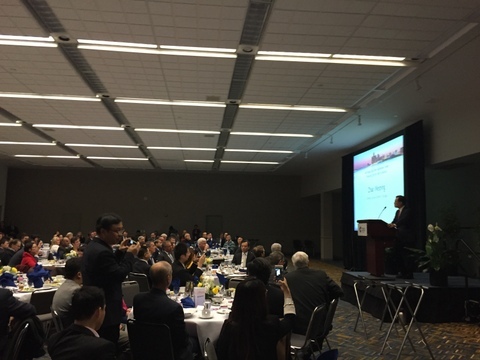 The dialogue then became an annual event and since 2015 has been titled US-China Automotive Forum, held by the CCPIT Automotive Industry Committee and the Michigan Economic Development Corporation.